You'll be £14.99 closer to your next £10.00 credit when you purchase Walking D-Day. What's this? Paul Reed's latest battlefield walking guide covers the site of the largest amphibious invasion of all time, the first step in the Allied liberation of France and the rest of northwest Europe. The places associated with the landings on the Normandy coast on 6 June 1944 are among the most memorable that a battlefield visitor can explore. They give a fascinating insight into the scale and complexity of the Allied undertaking and the extent of the German defences – and into the critical episodes in the fighting that determined whether the Allies would gain a foothold or be thrown back into the sea. All the most important sites are featured, from Pegasus Bridge, Merville Battery, Ouistrehem and Longues Battery to Juno, Gold, Omaha and Utah Beaches, Pointe du Hoc and Sainte-Mère-Église. There are twelve walks, and each one is prefaced by a historical section describing in vivid detail what happened in each location and what remains to be seen. Information on the many battlefield monuments and the military cemeteries is included, and there are over 120 illustrations. Walking D-Day introduces the visitor not only to the places where the Allies landed and first clashed with the Germans defenders but to the Normandy landscape over which the critical battles that decided the course of the war were fought. An essential battlefield guide for anyone interested in walking the more well known areas of the D-Day landings. Divided into twelve sections, Walking D-Day describes two walks around Pegasus Bridge and the Merville Battery in the 6th Airborne Division's sector, two for each of Gold and Juno Beaches, one for Sword with an additional walk covering the advance of the 1st Special Service Brigade to Pegasus Bridge, and single walks describing Omaha Beach, Utah and the 101st Airborne Division, the 82nd Airborne Division, and Pointe du Hoc. The walks are precisely referenced and easy to follow with a historical background accompanying each, providing about as comprehensive a description of the events which ensued as is possible in the necessarily limited number of pages devoted to each subject. This, together with many photographs and veterans accounts, adds significant life and further dimensions to what would otherwise be a standard battlefield tour of monuments and museums. Normandy and the D-Day beaches are one of the most popular destinations for battlefield tourism, with large numbers of visitors going to pay respect to the men who fought there. This walking guide provides twelve walks that cover this area, filling a somewhat surprising gap in the D-Day literature. As someone who has spent a considerable time walking battlefields around the UK and much further afield, I know only too well the value of good guide books. The Pen and Sword Battleground series is very good, and this latest publication, Walking D-Day, maintains that high standard. Walking D-Day is a little larger than most of the books in the series and it covers a lot of ground, both figuratively and geographically. 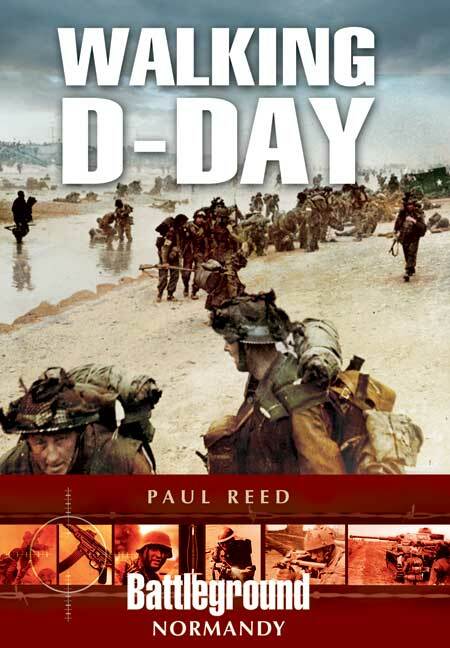 Paul Reed’s book attempts to guide us across the entire Normandy battlefield. So, as well as detailing walks along the sites mentioned above, including Sword, Juno, Gold, Omaha and Utah beaches, the book also takes us round locations such as Arromanches and the Mulberry harbour, Pointe du Hoc and Ste-Mère-Eglise. It is packed with illustrations and has plenty of maps. Each of the twelve walks is preceded by an historical outline which includes eye-witness accounts from participants of the fighting in that particular area. The walks explain all that is to be seen relating to D-Day along the route and where refreshments can be obtained on the journey. The directions appear to be comprehensive and clear, allowing each walk to be followed with ease. What is particularly useful is that every change of direction is mark in bold type. This is an excellent book that would serve well in its intended duty as a hand-held guide. It is also well worth a look for anybody who isn't planning to visit Normandy in the near future, but is simply looking for some well-written work o the initial engagements of the Allied return to France.